ProduKey recovers the Product IDs and CD keys of Microsoft Office, Windows, Exchange Server, SQL Server, Visual Studio and some of the Adobe and Autodesk products installed on your machine. You can also view this information for for another machine using command-line options. How to extract: Download the ZIP package and extract to a folder of your choice. Launch ProduKey.exe. 'Prefer the product name from Office Registry key' - ProduKey first tries to extract the product name from 'ProductNameNonQualified' and 'ConvertToEdition' Registry values, like it did starting from version 1.86. Antivirus programs have a tendency to quarantine or delete Produkey, HeapMemView, and a few of Nir's password recovery tools as well. 90% of Nirsoft utils will pass inspection just fine. Nirsoft is NOT malware by design, and so long as you keep your firewall, user accounts and security updates reasonably current, you'll do just fine. I suppose, in the wrong hands, some of the tools might be mildly threatening to low-security systems. Chances are, though, if a skilled cracker set out to compromise your system, they'd likely use something stronger than Nir's utilities to do it. What carbonize and Void said. Nirsoft's utils are not malware and will not damage your system. However, because they usually poke around in your system looking for info, they use methods that malware often uses, and which causes antivirus programs to identify them as malware. 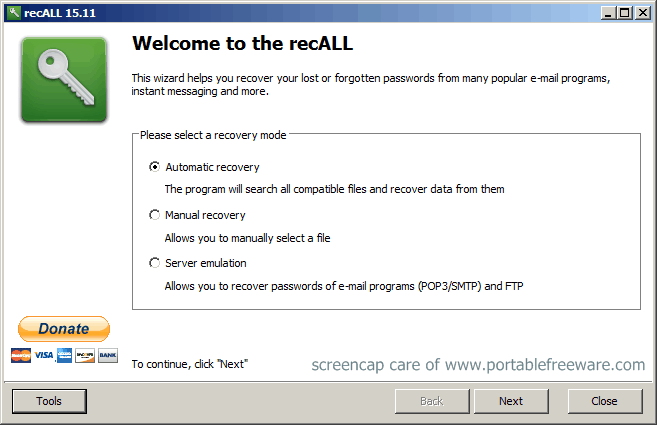 recALL allows you to quickly recover passwords from more than 270+ programs (mail, web browsers, instant messengers, FTP clients, wireless, etc.) and license keys from 2,800+ applications. It can also recover passwords from damaged Windows installations and many applications supporting FTP, POP3 and SMTP protocols, even if the program is not yet supported. Although the website is in Polish, the program supports 9 languages (including English). How to extract: Download the "portable" ZIP package and extract to a folder of your choice. Launch recall.exe. What's new? See Polish change-log here. Why is MailPassView listed as a Similar/alternative app? MailPassView's function is much narrower. It only recovers passwords from email clients, and does not look for product keys. recALL recovers passwords from many different classes of program and also finds license keys. You don't even put the two programs in the same category. You have recall listed under Security - Product Key Recovery, while you have MailPassView under Security - Password Recovery. Enchanted Keyfinder (formerly Magical Jelly Bean Keyfinder) retrieves the product keys for many products including Adobe, AutoCAD, Macromedia, Sony and more. Microsoft products include Windows 95, 98, ME, NT4, 2000, XP, Vista, Server 03 and 08, Office 97, XP, 03, 08, and others. Keys are drawn from the registry or from an unbootable Windows installation. You can also copy the key to clipboard, save it to a text file, or print them for safekeeping. How to extract: Download the ZIP package and extract to a folder of your choice. 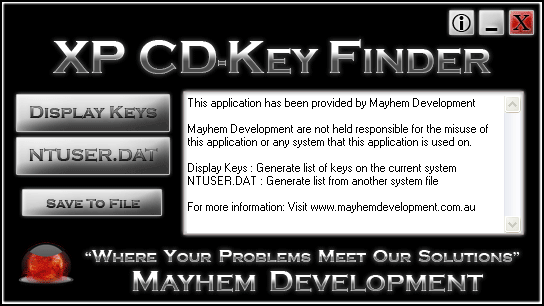 Launch keyfinder.exe. 1. Fixed bug where SavePath is not read correctly from settings. 2. Implemented a new feature, User defined config file. 3. Changed default setting for autosave path to a relative value. 4. Disabled forcing UAC prompt. 6. Fixed LoadHive setting and SoftwareHivePath setting. 7. Finished fixing the web links for the new project. 12. Implemented a path to settings file setting. both stable and unstable updates. setting is ShowBlankSerials. By default is false. 1. Added MS Office product description derived from the GUID. Affects Office 2000 through Office 2010. 2. Fixed Office 2010 CD Key misreporting. 3. Fixed browsing for a hive in WinPE environment. 4. Updated all the links for the new project page. 5. Updated command line switch documentation. 6. Checks if running as administrator token. 8. Compiles in Delphi 7 now. For the download link instead of having to always update it you can just point it at this url. it will always download the latest version from the project. XP CD-Key Finder allows you to quickly recover your products keys for Windows, Office and Exchange, including XP, Vista, 7, and Office XP, 2003, 2007. It will also allow recovery of keys from a system that won't boot thanks to support for external files. This utility will also allow you to quickly access and save your IP address, computer name and current user account details. How to extract: Download XpKeyFinder.exe to a folder of your choice and launch. In addition to not working for me, it also does not appear to be open source. On the creator's website it is listed as Freeware and I see no link to the source. 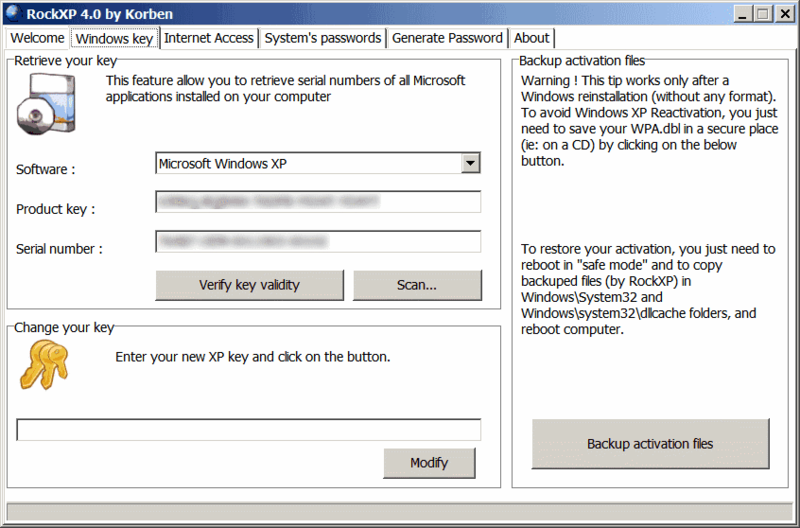 RockXP lets you retrieve the product keys for a variety of Microsoft products. The program allows changing your Windows XP serial, as well as many view other OS-internal login/passwords including XP login, HASH, Windows Protected Storage, and Remote Access Settings. Includes a password generator for random, secure passwords. How to extract: Download the EXE file to a folder of your choice. Launch the program by double-clicking on RockXP4.exe. I noticed some suspicious behaviour of my system after i downloaded and run this programm. a popup-window apeared showing a countdown of 1 min and told me that my system will reboot. After the reboot of Windows, the Data Execution Prevention deactivated a programm. i hope this is not a virus. Eron, If you did get a virus it was not related to RockXP because I have scanned it with ClamWinPortable and AVG and come up with nothing. Not to mention I used this program a long time ago and never had any problems. Also, it does not call home so don't worry. CAUTION: Close all other programs when running this one. Has caused system crashes for me.